Posted November 21, 2016 8:59 AM by Benjamin De Maar. Welcome to Tech Spotlight, a new ITS series providing regular updates on the most exciting new technology products and services. To start off, we are going to look at one of the most exciting areas in technology, artificial intelligence (AI), by exploring the Amazon Echo Dot (2nd generation) with the Alexa voice assistant. Computers can’t think for themselves yet but with the Amazon Alexa, Google Assistant, Microsoft Cortana, and Apple Siri voice assistants, we are closer than we’ve ever been. Voice controller for smart home devices. Prime members can make Amazon.com orders and get exclusive deals. Use popular music streaming services, such as Amazon Music, Spotify, Pandora, and others. Get a news flash briefing with customizable sources. Check traffic for the best route for your commute. Create shopping or to-do lists, viewable within the Alexa app. Play Audible audiobooks or have Alexa read Kindle books. Assist in the kitchen by reading recipes and doing measurement conversations. Request the weather forecast or movie showtimes. Ask random questions, like the CEO of Honda Motor Company or Prime Minister of Canada. And it doesn’t stop there, find more things to try at Amazon’s Alexa Help and Support or Things to Try pages. It has thousands of always expanding third party skills you can add for additional functionality not built-in, like the Domino’s skill for ordering a pizza or the Uber skill for calling an Uber ride. 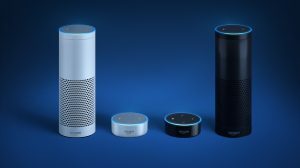 The Echo Dot is not meant to have room filling sound, as the built-in speaker is similar to what you’d find in a smartphone. That’s why it has a 3.5mm audio output jack and Bluetooth to connect a speaker or entertainment center of your choice. Echo Dots can be affordably scattered throughout your apartment or house for voice coverage in multiple rooms. For this reason, Amazon released an update called Echo Spatial Perception (ESP) which detects the Echo closest to you and only that one responds. Then there’s no confusion of multiple Echos, in voice range, responding to the same question. The competitors include the Echo Dot’s bigger brother the Amazon Echo smart speaker at $179.99 (or refurbished at $149.99) and the new Google Home at $129. There have been rumors that Apple will release a stand-alone Siri speaker but no official word from Apple on if this is true or when it would be available. The issue with the Google or a rumored Apple smart speakers is their third party support. The Google Home currently just has a hand full of partners initially and won’t open for developers until December 2016, and Apple’s HomeKit platform, for Siri voice integration, has had a poor adoption rate. May the future of AI be bright and not apocalyptic, like the movies. Disclaimer: This is for information purposes only. ITS does not have any contract or agreement that requires us to recommend any specific product or service. We encourage you to read reviews and research the Echo Dot fully. Products directly tested by ITS include the Echo Dot 1st and 2nd generation with and without a Bluetooth speaker connected.